I had to hide a few for our company coming or these would have all been gone in a day. Chocolate, Caramel, Coconut over a crunchy style shortbread buttery cookie, with a chocolate bottom and chocolate drizzle over the top! The coconut will be crunchy and delicious! Chocolate and caramel are a perfect match! There squeeze bottles make it so easy to drizzle the chocolate over the tops! After cookies are completely cool dip the bottoms first, they will dry quicker if you put them in the refrigerator till set, oh and guess what? if you don't like caramel, just strip the tops and it's another famous fudge stripe knockoff cookie, so you get two for one in this post! Using an apple corer was so easy to get perfect rings for the middles. 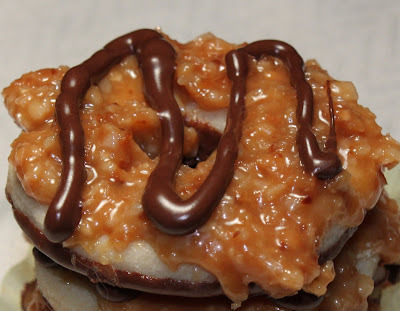 A tender vanilla shortbread cookie, covered with caramel, coconut, chocolate drizzle on top and dipped chocolate on the bottom . Indulge, these do take longer than a normal batch of cookies to make, so set some time aside, you won't be sorry. Mix all ingredients to form a ball. Refrigerate overnight. Bring dough to room temperature. On a pastry board, roll out. Cut out with a two inch round cutter ( I used a linzer cutter) Cut out the middles using an apple corer. Place on an ungreased cookie sheet and bake at 350 until edges of Cool on wax paper. After completely cooled dip bottoms into melted chocolate using 1 - 12 oz bag of semi sweet chocolate melted in microwave refer to directions here . Place cookies on wax paper lined cookie sheet and refrigerate until chocolate is cold. In a microwave proof bowl melt a 12 oz bag of caramels with 4 tablespoons of heavy cream for three minutes, keep stirring till smooth and totally melted, add three cups of **toasted coconut ( see below for instructions), if while spreading it becomes cold or too hard reheat with more heavy cream a tablespoon at a time until spreading is easy, microwave for one minute at a time . Using a spoon, place caramel in the round part the circle, trying not to file the hole of the cookie. Place back in the refrigerator when you have coated all cookies. Melt more semi sweet chocolate and make thin stripes going in an M direction. Here are the first three in this series of knockoff's if you missed any! You've done it again Claudia - these cookies are OTT and crazy good!!! Wow! These are my FAV girl scout cookie! I haven't had these in years. I can't believe you made these..your company must have been super impressed! these look amazing! What gave you the idea to recreate all these cookies? @denise thanks so much your too kind! You are perfecting the art of cookies! Now we will have to refer to you as the "Cookie Queen"! Gosh, these are amazing! Love everything in that recipe. All I wanted to do is to wallop them all! Have a great weekend, Claudia. YOU could go door-to-door and sell these! These aremy favorite GS cookies to begin with but I've no doubt that these are 100 times fresher and better! These look crazy good! Better than the real things! I have to agree with Chef Ryan, you should now be known as the Cookie Queen! Claudia, these look fabulous!!! I can feel the pounds wrapping around my waist just looking at them. Caramel and toasted coconut are irresistible together in my opinion... add them as a topping to a shortbread cookie, and they are dangerous! oh my, that is my favorite girl scout cookie, my hubby's is the thin mint, I bought 4 boxes of them a few weeks ago, I'm making your recipes next time I see a girl scout and get a craving. Thankyou! You pix are looking really great too.